“One of the best parts about West Palm Beach is the art district and the city’s accommodation of the arts. There is so much art and culture around here, new galleries popping up and even the library has a photographic center.” This was Stephen Brecher’s response when I asked what he loved about living and working in West Palm Beach. Stephen is the Visitor Experience Manager at the Norton Art Museum, and truly loves what he does and the place where he comes to work every day. Ralph Hubbard Norton and his wife, Elizabeth Calhoun Norton, started the Norton Art Museum in 1941. He made his wealth as an industrialist, heading the Acme Steel Company based out of Chicago. The two began to winter in the Palm Beaches starting in 1935. The Nortons were both huge patrons of the fine arts and developed a sizeable collection of paintings and sculptures. In fact, a significant portion of the Chinese collection presently at the museum came from the Norton’s personal collection. Stephen has been working at the Norton for nearly three years and describes his work as “the best job. I genuinely enjoy what I do and the people I work with. To say the staff is like a family is an understatement.” He is a graduate of FAU with a bachelor of fine arts degree, and enjoys being an artist himself across several mediums. Interestingly, he went on to tell me that the biggest demographic of visitors are residents of Palm Beach Island, many of whom have been visiting and contributing to the museum for over 30 years. 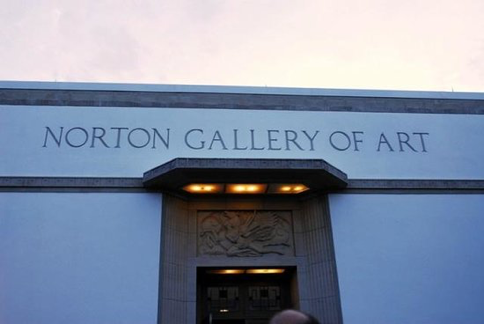 “We get visitors of all ages too, for instance we have school groups in here every day from all over Palm Beach County.” It seems that the Norton is unique in that the majority of its visitors are truly interested in the fine arts, rather than just another art museum that visitors feel they are obligated to see. If you have a chance, stop by the museum and just take a walk around. The museum is open every day from 12-5 PM except Monday, and will remain open during its construction. West Palm Beach has so much to offer, and it is refreshing to know that arts and culture are high on the priority list of the city. So before you hit the bars and restaurants of Clematis Street, stop by the Norton Art Museum for a unique art and culture experience, a chance to meet the wonderful staff of the museum, and see what they have planned with their exciting on-going expansion project! Would you like to be featured in the downtown “West Palm Beach“ Spotlight or know someone who would? Let us know! Send an email to Lanae@JeffRealty.com. Lanae Barnes is available to handle all your questions and real estate needs. Give her a call at (561) 236-9617 or email her at Lanae@JeffRealty.com. Posted in Singer Island, Singer Island Condos, Singer Island condos for sale on January 23, 2017 at 3:52 pm. Lanae’s West Palm Beach Spotlight: Free Transportation for All!